1. 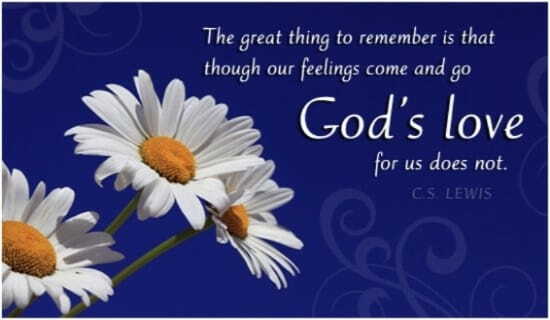 God loves you unconditionally. We live in a sinful world that is fraught with conditional promises and relationships. Sometimes even those closest to us let us down. Despite this reality, our greatest need is to be loved unconditionally. We want to be loved with a perfect, sacrificial, forever kind of love in spite of our faults by someone who knows us intimately. Further, we want to be supported and inspired by that love to not only become better people, but to also leave lasting impressions on this earth. God provides us with that as no one else can. That's what theologians have meant over the years by saying that we have a God-shaped hole in our heart; there's a space we were created with that only God can fill. And the love we were made to need is strong and unshakable. The Apostle Paul, who founded the early church, writes, "For I am convinced that neither death nor life, neither angels nor demons, neither the present nor the future, nor any powers, neither height nor depth, nor anything else in all creation, will be able to separate us from the love of God that is in Jesus Christ our Lord" (Romans 8:38-39). That love claims you by faith. Wherever you are feeling unloved today, drink it in. 2. You are redeemed and have an eternal home in heaven. When I worked as a chaplain, Psalm 121 was the most popular scripture read at bedsides. That's because the psalm describes God as our unfailing Protector who gives us an eternal home. The psalmist reassures us, "The Lord watches over you - the Lord is your shade at your right hand...The Lord will keep you from all harm - he will watch over your life; the Lord will watch over your coming and going both now and forevermore." We worship a God who never leaves us, and he wants a relationship with us both in this life and beyond. We have been blessed with the promise of heaven through faith in Jesus Christ. It is by his blood that we have been washed clean and accepted by our holy God. This redemption plan was Christ's assignment, and it was all done in love (John 3:16). And the Holy Spirit is calling you today, reminding you of all God has done for you and wants to be in your life. Look to him, hold his hand, experience his salvation. 3. God formed you with intention and knows you intimately. The God who crafted creation and its redemption plan through Jesus also crafted you. The psalmist praises God's handiwork in Psalm 139 by saying, "For it was you who formed my inward parts; you knit me together in my mother's womb. I praise you, for I am fearfully and wonderfully made..." God created you intentionally, and you are "fearfully and wonderfully made." Not only are you God's masterpiece, but God has a special plan for your life that even spans to the number of your days. The psalmist continues, "Your eyes beheld my unformed substance. In your book were written all the days that were formed for me, when none of them as yet existed." This means your existence is no mistake. God did not make any wrong moves. Isn't it amazing that the Creator of the universe knows you and formed you specially himself? 4. God's plan for your life is to prosper you, not to harm you. Our world knows brokenness and sin, but God knows hope and restoration. 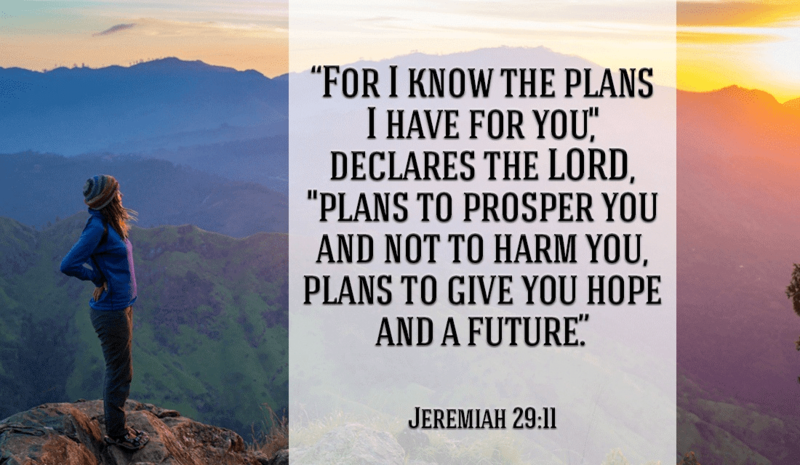 One of my favorite verses in scripture is Jeremiah 29:11, "'For I know the plans I have for you,' says the Lord, 'plans to prosper you and not to harm you, plans to give you hope and a future.'" God's plan for your life includes hope and a prosperous future, or one in which you thrive. Psalm 103 lists many ways that God wants to bless you. The psalmist exclaims, "Praise the Lord, O my soul, and forget not all his benefits - who forgives all your sins and heals all your diseases, who redeems your life from the pit and crowns you with love and compassion, who satisfies your desires with good things so that your youth is renewed like the eagle's." God is invested in your well-being and working toward your renewal, wholeness, and healing daily. In addition to blessing us, God has big dreams for our lives and beckons us to follow. Obedience often requires faith and risk, but God will delight in your dependence on him and always be there to support you. 5. You have special strength available to you through faith. The best resource that’s available to you is the power of Christ. If you are facing an uphill battle, repeat this verse to yourself frequently: “I can do all things through Christ, who strengthens me” (Philippians 4:13). God will never call you to a place and leave you unattended. Be assured that the God who has numbered the hairs on your head is fighting for you. His favor will surround you like a shield (Psalm 5:12). You have an insurmountable ally in our God -- for if God is for you, who can be against you (Romans 8:31)? When you boldly claim this truth with expectation, you give God the space and invitation to show his glory.